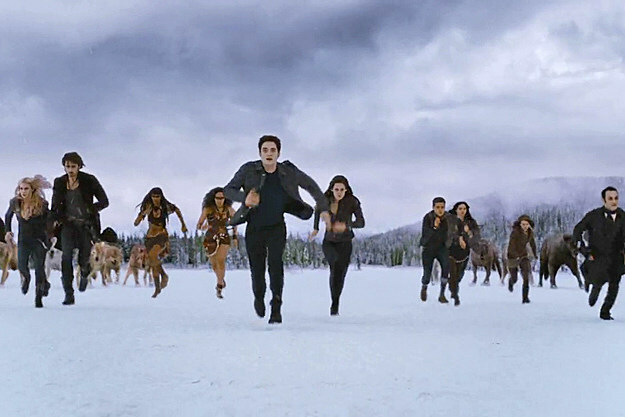 The end of Breaking Dawn – Part 1 leaves our favorite vampire family with numerous changes. Bella (Kristen Stewart) endures a bone-breaking birth to bring a half-human, half-vampire into the world and for some reason, gets to name it Renesmeé without anyone commenting on how ghetto that is. Jacob (Taylor Lautner) has imprinted on, or developed a lifelong dedication to, the newborn baby and it is sure to be a little awkward, especially since Rosalie (Nikki Reed) is obsessed with her, too. Edward (Robert Pattinson) takes matters into his own teeth and turns Bella into a vampire before her human life ends, leaving her with the telltale bright red eyes. BD2 picks up right where BD1 left off, with the credits simulating the process of Bella transitioning from human to immortal. The impressive artistry and symbolism are definitely hints of what is to come – an epic visual stunner of a film that arrived just in time to lend this saga a little credibility. Bill Condon finally takes firm hold of the reins and leads the cast in a direction nearly worthy of their popularity. Edward and Bella are less hopelessly sappy since they can settle into their roles as protectors of the rapidly maturing Renesmeé (played by the adorable Mackenzie Foy). The uncomfortable fights between Jacob and Edward have dissolved, as well as the general animosity between the vampires and the werewolves of Forks, Washington. This is fortunate because all of the hatred they have needs to be directed at the Volturi and their witnesses as they plan to ambush the Cullens under the pretense of protecting their world from Renesmeé. Alice (Ashley Greene) and Jasper (Jackson Rathbone) flee while the rest of the Cullen clan rounds up witnesses (and possibly soldiers) from all corners of the world. While I could’ve done without the stereotypical garb that each coven wears, it was still cool to see the various characters brought to life. Learning about the different skills that the other vampires have and how they can prove useful in battle was one of the most enjoyable aspects of the book. What was not awesome about the book was that there was no fighting. At all. Everyone knows that Jacob’s abs and the vampire fights are the selling points of the movies! The climactic battle scenes have been consistently amazing, and I wondered what would be done to make up for that deficiency. I will not tell you how, but BD2 figures out how to deliver a little action that fans have come to expect without abandoning the world of Meyer’s imagination. As thrilling as the action was, the acting performances were far more impressive. Now I am not among the throngs of people who feel compelled to congratulate Kristen Stewart for smiling or wearing a dress to a premiere, and that Snow White travesty (the film, not the fooling around) certainly didn’t help her cause with me. But KStew manages to be convincing and entertaining in BD2. It is as if she transforms with Bella, shedding her awkward and annoying demeanor in favor of a new fierceness. She hasn’t shown this much moxie since New Moon, when she sank deep into a depression and then valiantly vaulted herself out of it and all the way to Italy in order to save Edward. Stewart’s lackluster performance has always played a role in the quality of the past Twilight films, so her showing up made a huge difference for the final installment. As Aro (Michael Sheen) says upon meeting the new and improved Mrs. Cullen, “Immortality becomes you!” I also have to say that I enjoyed how Sheen takes a page out of Johnny Depp’s book and ups the comically creepy factor by about ten notches. The whole cast in general seems to have gotten a memo telling them to do better and knock back a few coffees, and we should all be glad they heeded the advice. I wish the same synergy that made BD2 such a satisfying finale had been present throughout the franchise, but I will settle for an excellent ending and yet another great film option for moviegoers this fall.